The first commercial food and agriculture applications of synbio have been announced, such as Evolva’s synbio versions of vanilla. Products derived from synthetic biology (popularly called synbio), a rapidly growing new technology, are beginning to enter the marketplace without a regulatory framework in place that provides for pre-market safety assessment of its unique risks to health and the environment. In the very near future, a host of food and agricultural products could be on the marketplace without labeling and in natural ecosystems without biosafety controls or indeed, understanding about the effect of Synthetically Modified Organisms (SMOs) on biological diversity. This fact sheet gives a short overview of synbio, a few of its applications to food, agriculture and consumer products, and an explanation of the U.S. government’s rationale for applying a nearly thirty-year-old policy for deregulating Genetically Modified Organisms (GMOs), and now, SMOs as well. In April 2008, IATP participated in probably the first synbio “teach-in” for NGOs.2 A synthetic biologist3 explained that molecular biology, the scientific platform for transgenic modification of agricultural plants, takes DNA from genes and rearranges them like a kidnapper pasting a ransom note from cuttings of different magazines. However, he said, molecular biology is “slow and messy” and you have to experiment to check that your new DNA “message” works to express the desired trait. 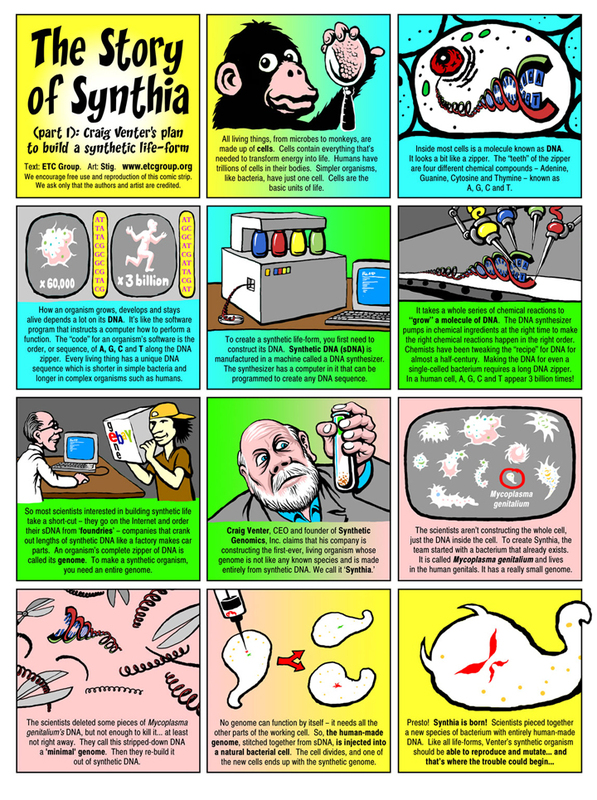 By contrast, he continued, the synthetic biologist designs the desired DNA sequence on a computer, based on knowledge about the sequencing of the whole genome of a simple organism, such as a bacterium. (The computer basis of synbio is evident already in the title of the first international conference dedicated to the discipline, “synthetic biology 1.0,” held in June 2004.4) The synthetic biologist specifies the length of the desired genetic sequence in the genome and a specific combination of four amino acids to transform the computer design into a synthetic DNA sequence. According to a mini-history of synbio, by 2008, interdisciplinary teams of biologists, chemists, computer programmers and engineers were asking, “Could synthetic biology evolve into a sophisticated engineering discipline on par with electrical or mechanical engineering? Could practices like parts standardization and abstraction hierarchies6 be mapped into biological systems?” (“Abstraction (or abstraction hierarchy): a system for managing biological complexity by eliminating unnecessary details; abstraction allows researchers at various levels (and in various fields) to work with and share details about biological data without specialized knowledge.”7) Their answer is a resounding “yes!” bolstered by numerous examples of bio- “toggle switches,” “autoregulatory circuits,” logic gates and other gene circuitry devices programmed in novel DNA arrangements that one day could be applied to produce novel products. Of course, since 2008, synbio techniques have proliferated and become more complicated. The annual $500 million budget of Stanford University’s Department of Biological Engineering9 alone supports dozens of research projects for myriad commercial applications. The first commercial food and agriculture applications of synbio have been announced, such as Evolva’s synbio versions of vanilla, sassafras and resveratrol, a dietary supplement ingredient claimed to improve heart health and diabetes control and aid weight loss.10 The synbio versions enable manufacturers to circumvent some causes of unreliable supply lines, e.g. plant disease, inclement weather and farmers demanding more money for their crops. These rosy market outlooks are based in part on the assumption that plant modification techniques grouped under synbio will not be subject to synbio-specific regulation, at least in the United States. A recent report, co-funded by the U.S. Department of Energy, defines a “key challenge” for the U.S. pre-market regulation of synbio products: “Synthetic biology and other new genetic engineering techniques will likely lead to an increase in the number of genetically engineered plants that will not be subject to review by USDA [U.S. Department of Agriculture], potentially resulting in the cultivation of genetically engineered plants for field trials and commercial production without prior regulatory review for possible environmental or safety concerns.”17 Although this report includes some options for regulating synthetic biology within existing legislative authorities, U.S. congressional resistance to passing strong environmental legislation of any type probably precludes the passage of new authority for synbio specific regulation. Because U.S. regulatory agencies are chronically understaffed and under-budgeted,23 this product-by-product review requirement all but mandates deregulation by staff overwhelmed by commercialization applications. Indeed, the USDA’s Animal and Plant Health Inspection Services (APHIS), the chief regulator for agricultural GMOs, “has not denied any petition for deregulation on the basis that the genetically engineered plant has a greater plant pest risk than its conventional counterpart.”24 Furthermore, APHIS requires no post-market surveillance of the deregulated transgenic “events.” However, since SMOs do not have a conventional comparator, how will U.S. regulators justify the deregulation of SMOs? One recent report on the ecological consequences of the environmental release of SMOs suggests that these organisms will simply be released for trials on their effectiveness without any prior assessment of their safety. “Synthetic biology is moving toward a future of assumed organism release, be it intentional or accidental. Monitoring and surveillance could be employed to track these releases, but the scope of the need may far exceed any present infrastructure.”25 Part of what is driving this assumption is the large investment of public and private funds in synbio applications, e.g., to reduce fertilizer use by redesigning the nitrogen fixation gene cluster in a plant with synthetic parts,26 which eventually must be tested in open field trials to be commercially viable. Ready, field-tested alternative means to achieve those ends, e.g., reducing fertilizer use by expanding the use of nitrogen-fixing cover crops, are not considered by the public and private synbio promoters. Field testing synbio applications safely will be very difficult because of the many unknowns about how synthetically engineered crops will interact with other plant species. One synbio research group is concerned that genes in the synbio plants will transfer to other species, resulting in “off target mutagenesis after attaining the desired modification in a target sequence.”27 In other words, will SMOs designed to produce a certain trait have a very different and perhaps harmful trait when SMO genes transfer to other plants? Some synthetic biologists have assumed that environmental release of SMOs is inevitable and that physical barriers to prevent horizontal gene transfer to cultivated or wild plants are inadequate. They are experimenting with different ways to reduce the likelihood of gene transfer and its attendant unintended effects. First, they have learned from the failure of transgenic “kill switches,” i.e., genetic use restriction technology, popularly called Terminator,28 to prevent use of patented seeds beyond one planting season: “even GMM [genetically modified microbes] programmed to ‘self-destruct’ pose an environmental risk, as their genes can be potentially scavenged by other cells after they have died.”29 As a result of the transgenic “kill switch” failures and the tendency for genes to mutate as they lose their programmed information, synthetic biologists are searching for ways to prevent horizontal gene transfer (HGT) and attendant harmful genetic transformations. There is some consensus that more than one kill switch will have to be built in to SMOs. “However,” notes a group of synbio biosafety researchers, “the higher the complexity of a safety device, the more prone it may be to disturbance and failure.”30 The term “disturbance” here may be understood in the sense of electronic like circuitry: too many gene circuit devices in a synbio organism may result in “disturbance” of the complex of redundant devices designed to prevent HGT. One study has attempted to anticipate the difficulties of field testing SMOs by proposing different ways of modeling SMO interactions with wild and cultivated plant varieties: “Organisms are typically tested and evaluated in monocultures, or highly limited mesocosms. Data collected from a mixed-population environment are far more applicable to current and future needs [of synthetic biology]. Some effort has been made to develop synthetic communities. Can such communities serve as adequate stand-ins for true environmental diversity?”31 The difficulties of forecasting the HGT capacity of SMOs and building biosafety devices in them present a great challenge not just toqualitative or quantitative modeling of HGT scenarios, but to providing a synthetic version of biodiversity in which to test the HGT capacity of SMOs. A major U.S. regulatory impediment to identifying harmful SMO interactions prior to commercialization is that the bio-safety data from such modeling exercises for products of likely commercialization will be classified as Confidential Business Information (CBI). Under U.S. law, “data necessary to ensure the safe use of GMOs can be withheld from public peer review[...]regulatory expert panels cannot fully substitute for the quality assurance offered by broad collegial peer criticism of published studies, including the study designs, the methods, the results attained and their interpretation.”32 If applicants to commercialize GMOs claim application data is CBI, only government regulatory scientists review the data, and not the public peer review characteristic of science. CBI claims by GMO product developers to U.S regulators have crippled independent peer-reviewed research to verify safety and efficacy claims made for GMOs. One researcher, while conceding that CBI claims should apply to trade secrets not protected by patent law, has argued: “In practice, no experimental protocols or data from studies conducted with the purpose of demonstrating health or environmental safety should be claimed confidential. Study methods, techniques for biosafety data assembly, analysis and interpretation should therefore be without CBI claims.”33 While this argument prevails in European regulatory agencies, it has yet to do so in U.S. agencies. Despite very sophisticated scholarship that shows specific steps, scientific, legal and commercial, to compose a unified synbio discipline, there is much debate about whether this or that post-transgenic technique belongs to synbio. According to one researcher, “If you were to ask five synthetic biologists to define their field, you’ll get six different answers.”34 For the public interest, whether or not a laboratory technique or practice is identified as belonging to synbio is less important than whether the products and ingredients produced by post-transgenic processes can be regulated effectively by U.S. federal agencies mandated to protect public and environmental health and worker safety. Because the U.S. government has worked hard to promote its approach to deregulating GMO products, as well as supporting the commercialization of these products around the world,35 similar promotion for products derived from synthetic biology may be expected. In the near future, there is little prospect that U.S. regulation will become synbio specific. The decision to make do with existing regulatory frameworks and legislative authorization was set in 2010, when the Presidential Commission on Bio-Ethics published a report on synthetic biology. The report recommended a regulatory course of “prudent vigilance” midway between what it understood of the European Union’s precautionary principle (“protections should not be relaxed until science provides evidence that harm is unlikely to result”) and a “proactionary” principle that assumes a governmental burden of proof to show that each product and process of synthetic biology is unsafe and not beneficial.36 The recommendation has no practical regulatory effect nor does it require action. 2. The Synthetic Biology Teach-in was organized by the ETC Group, the International Center for Technology Assessment and Friends of the Earth, and was held on April 14, 2008 in Washington, DC. 3. Chatham House non-attribution rules still apply. 4. Gregor Wollbring, “Bio-tech, NanoBio-tech, SynBio-tech, NanoSynBio-tech? : The changing face of biotech law? (Part 1),” JIBL 4: 1 (2007), 177. 6. Positioning Synthetic Biology to Meet the Challenges of the 21st Century, 12. 7. D. Ewen Cameron, Caleb J. Bashor and James J. Collins, “A brief history of synthetic biology,” Nature Reviews: Microbiology, 12 (May 2014), 383. 9. Laurie Garrett, “Biology’s Brave New World: The Promise and Perils of the Synbio Revolution,” Foreign Affairs, October 24, 2013. 10. Colin Barras, “Pharma to fork: How we’ll swallow synthetic biology,” New Scientist, April 10, 2014. www.newscientist.com and “Evolva starts commercial resveratrol production,” May 28, 2014. www.evolva.com and “Resveratrol Supplements,” WebMD, 2012. http://www.webmd.com/heart-disease/resveratrol-supplements (accessed May 29, 2014). 13. Beth Baker, “Should scientists try to create new life forms?” CQ Researcher 24:16 (April 25, 2014), 379. 17. Sarah R. Carter et al., “Synthetic Biology and the U.S. Biotechnology Regulatory System: Challenges and Options,” J. Craig Venter Institute, May 2014, 24. http://www.jcvi.org/cms/fileadmin/site/research/projects/synthetic-biology-and-the-us-regulatory-system/full-report.pdf (accessed June 2, 2014). 18. Jennifer Kuzma and Adam Kokotovich, “Renegotiating GM crop regulation,” European Molecular Biology Organization Reports, 12:9 (2011), 885. 19. The regulatory status of plants resulting from New Breeding Technologies,” NBT Platform, April 9, 2014. 20. Carter et al, “Synthetic Biology and the U.S. Biotechnology Regulatory System”, 14-15. 24. Carter et al, “Synthetic Biology and the U.S. Biotechnology Regulatory System: Challenges and Options,” 31, footnote 29. 27. Moto Araki, Kumie Nojima and Tetsuya Ishii, “Caution required for handling genome editing technology,” Trends in Biotechnology 32:6 (May 2014), 234. 29. Oliver Wright, Guy-Bart Stan and Tom Ellis, “Building-in biosafety for synthetic biology,” Microbiology 159 (July 2013, 1222. 31. Drinkwater et al, “Creating a Research Agenda for the Ecological Implications of Synthetic Biology,” 19. 34. Baker, “Should scientists try to create new life forms?” 363. 38. “Open letter to Ecover/Method,” June 2, 2014. http://www.etcgroup.org/content/open-letter-ecover-method IATP is a signatory. 39. “Trends in Synthetic Biology Research Funding in the United States and Europe,” Wilson Center Synthetic Biology Project, June 2010. http://www.synbioproject.org/process/assets/files/6420/final_synbio_funding_web2.pdf?